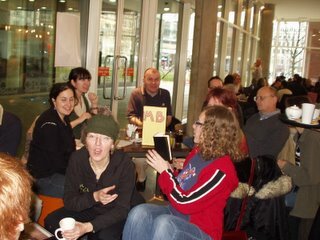 The Manchester blog meet was a big hit - about 30 people were there, and everyone seemed to enjoy meeting the faces behind the blogs they read. Chern Jie, a very friendly Engineering student from Malaysia who I met there (and whose eponymous blog I have just added to the manc blogroll) has put up some pictures and a nice long description of the multi-stage event here. That's where the above pic comes from. Chris, Tom, Norm, Spinneyhead and Clare have posted about it as well. Hopefully this will be the first of a series of once-in-a-while blogger social outings. Kro was so busy and, often, loud - maybe next time we can do it in the quiet side room of some old fashioned pub. But I suppose that wouldn't have the wireless. Thanks for the link, Kate. It was nice to meet you. It was indeed good to finally meet you. Hope to do it again some time. I finally posted a round-up of all the various accounts here.